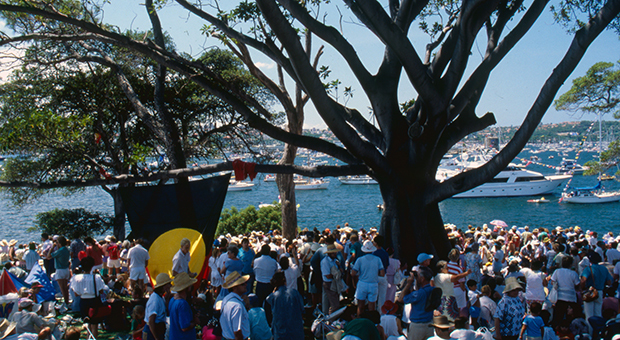 In January 1988, an Aboriginal Tent Embassy was set up at Mrs Macquarie’s Chair (at Mrs Macquaries Point / Yurong) in protest against the planned bicentennial celebrations of European settlement in Australia. 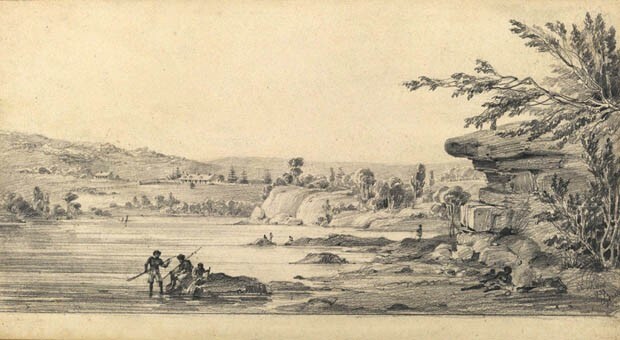 For Aboriginal people, the arrival of the First Fleet heralded the start of a catastrophic invasion and was an event to be mourned, not celebrated. 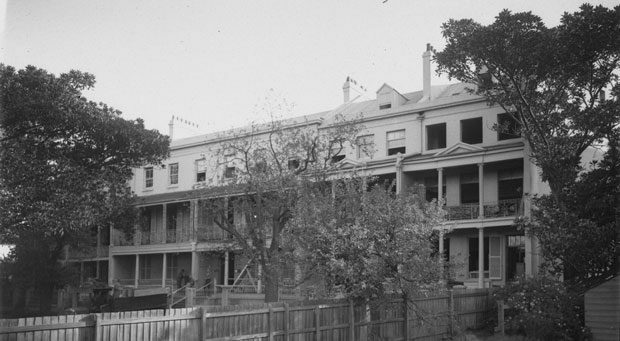 During the sesqui-centenary celebrations in 1938 Aboriginal activists did just that, holding an Aboriginal Day of Mourning Conference at Australian Hall in Elizabeth Street to campaign for civil rights and the abolition of the Aborigines Protection Board. This protest created a momentum that contributed to the significant civil and land rights gains of the 1960s and 1970s, but Aboriginal people continued to suffer injustice and inequality, and issues of Aboriginal sovereignty and self-determination were unresolved. In the lead up to the bicentenary, a national protest was planned to highlight these issues as it became clear that the 26 January 1988 was to be a national party with no consideration of the negative impacts of colonialism on Aboriginal people. 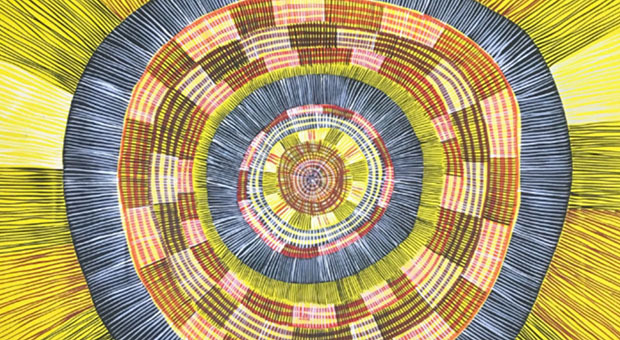 An Aboriginal March for Freedom, Justice and Hope through the centre of Sydney was planned for the same day, drawing Aboriginal people from all across Australia to Sydney. By mid-January, convoys of marchers began their long trek towards Sydney by bus and car. At the same time, about 20 local Aboriginal activists from the Redfern Aboriginal community pitched an Aboriginal Tent Embassy at Mrs Macquaries Point / Yurong, one of the prime public viewing points for the planned celebrations on Sydney Harbour. It was styled after the Aboriginal Tent Embassy established in 1972 outside Parliament House in Canberra as an ongoing campaign for Aboriginal land rights. Local activist Paul Coe read a declaration stating that although the United Nations ‘Universal Declaration of Human Rights affirms that all peoples have the right to self-determination’, and despite Lieutenant James Cook’s orders in 1768 ‘to take possession of a part of Australia with the consent of the natives…no such consent was obtained.’ Consequently, as spokesman Lyall Munro told local and foreign media, the protesters aimed to highlight the ongoing ‘Aboriginal struggle for land rights and self-determination’, and intended to stay until the celebrations on Australia Day. Over the next week the Tent Embassy protesters kept Aboriginal people across Sydney updated on preparations for the celebrations via Citizens band radio to Aboriginal radio station, Radio Redfern. The organisers of the Aboriginal March for Freedom, Justice and Hope had arranged for their protest to begin at Redfern Park at 10am on Australia Day and end with a rally at Hyde Park. The Tent Embassy protesters felt that this was keeping Aboriginal people out of sight of the main ‘battle lines’ on the harbour, and organised a second march to leave from Redfern Aboriginal Legal Service at 7am. Police had ordered the march not to continue to the harbour and had set up barricades, but as march organiser Jenny Munro later explained, the several hundred protesters simply ‘disbanded, walked through the barriers, regrouped, and continued marching down to Lady Macquarie’s Chair’. Throughout the day, the Tent Embassy protesters and their many Aboriginal flags were a visible and vocal presence on the point to spectators, media and the flotilla of boats that passed by on their way to Sydney Cove. Some protesters swam out to several boats flying Aboriginal flags, spectators on the point were reminded via megaphone that they were celebrating genocide, abuse was hurled at the passing tall ships re-enacting the voyage of the first fleet, and calls for land rights resounded across the point throughout the day. The Tent Embassy provided a timely reminder to spectators and television viewers on the day that not all Australians had cause to celebrate. 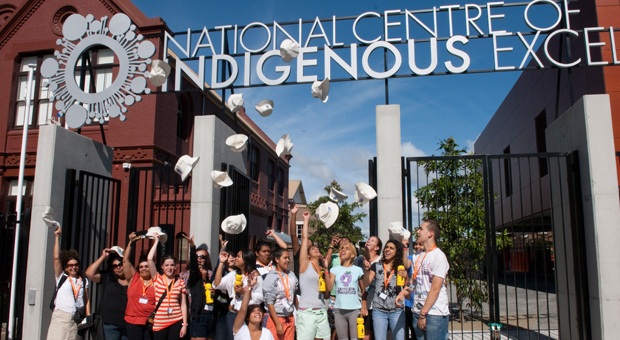 The protesters took down their tents after Australia Day, but the embassy provided a template for focussing media and public attention on Aboriginal issues during major events, as occurred 12 years later when Sydney hosted the Olympic Games.